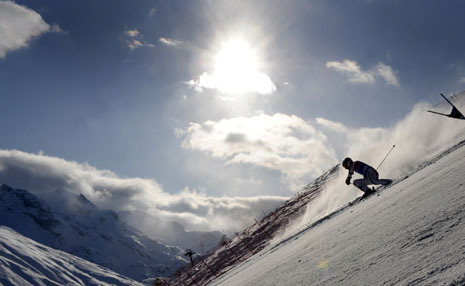 Situated in the Savoie at 1850 meters, Val d'Isere is the jewel in the crown of the French Alps. It has hosted over 130 competitions -- more than any other resort on the circuit. The origins of the event date back to 1963 when the U.S. ski team traveled to Val d'Isere for some early season training. To spice up their routine they organised a friendly race against the French. It was the first time the Americans had taken on skiers from the region and it kick-started a rivalry and popular tradition which led to the formation of the World Cup Series. Increased popularity for the resort and Olympic success of home-grown stars Henri Oreillier and Jean-Claude Killy persuaded organisers to add a new event in December 1968. For the first time, the World Cup series was acknowledged as a truly global tour. 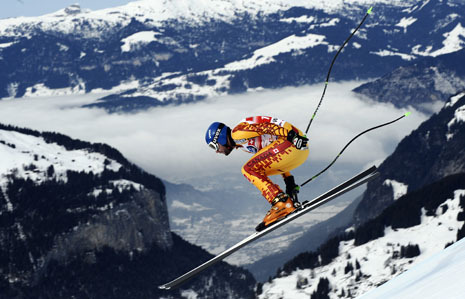 Wengen is home to the longest World Cup race -- the Lauberhorn downhill. This monster runs at an astonishing 4455 meters in length, keeping the skiers agonisingly on course for over 2 minutes and 20 seconds. From start to finish, the course snakes and turns through a vertical drop of 1025 meters. The Lauberhorn has also made a few Hollywood appearances in its time. The 1969 film Downhill Racer starring Robert Redford and Gene Hackman was partly shot in Wengen, as was the famous scene in On Her Majesty's Secret Service when James Bond is pursued down the tree-lined back slopes of the mountain. 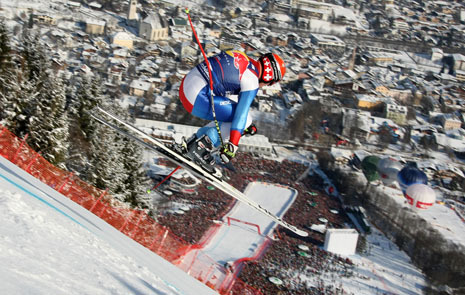 Didier Cuche of Switzerland takes 1st place during the Audi FIS Alpine Ski World Cup Men's Downhill on January 22, 2011 in Kitzbuhel, Austria. 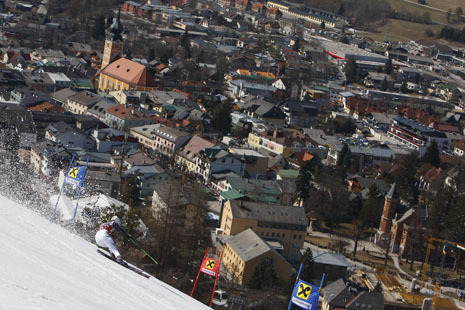 Kitzbuhel brings the best skiers from all corners of the globe to take on the legendary Streif downhill. The slope is by far the hardest on the World Cup circuit and is notorious for making mincemeat out of those who attempt to pull off its descent without complete perfection. All the elements of the classic downhill can be found here with sharp terrain edges, steep slopes, bumps and even an uphill shush but the most challenging component is the Mausefalle or Mousetrap. This aptly named launch pad is situated at the top of the course and at speed can result in jumps of 80 meters. Upon landing skiers are forced into a sharp compression and a sudden left hand turn which only the technically proficient survive. The Austrian town of Schladming will host the Ski World Championships for the second time in its history with some 400,000 visitors expected to attend. In 11 disciplines, 650 athletes from 70 nations will fight it out for 33 medals, with over 3,000 media representatives from around the globe reporting on events as they unfold. Approximately €52 million has been spent on preparations for the event -- broadening slopes, building bridges and race tunnels as well as a state-of-the-art base station to ensure this will be one of 2013's biggest sporting spectacles. The Swiss region of Lenzerheide used to serve as a high mountain pass through the Alps for travelers and farmers. These days it has become a favorite destination for winter sports tourists and a regular home for the season-ending World Cup Finals. Overall World Cup standings often come down to the wire, with fierce battles ensuing for the final few points. The winners are awarded the iconic crystal globes for individual disciplines and overall champions. In 2010 Lindsey Vonn won a record eight crystal globes -- three large globes for FIS World Cup overall titles and five smaller globes for Giant Slalom, downhill and Super G.
(CNN) -- With the European leg of the Alpine Skiing World Cup in full swing, CNN's Alpine Edge takes you inside five of the continent's most high-profile locations. As the planet's top skiers hurtle down the slopes, Alpine Edge will tell the stories behind the sport iconic resorts from France's Val d'Isere to 2013 World Championship venue Schladming in Austria. Click the skier icons on the map to find out more about the prestigious venues CNN will cover between now and March's season-ender in Lenzerheide, Switzerland.